Latest developments, innovations, emerging thrust areas in research are taken into consideration at the time of curriculum development. 1. Outcome Based Education 2. 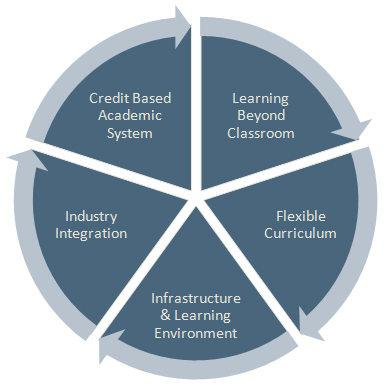 System Value Based Education System 3. Choice Based Education System 4. Interdisciplinary and Flexible Approach 5. Learning Beyond Class Room. Have multi-tasking profile hence enhances acceptance in jobs & research. Student May Change the branch/stream at later stages. 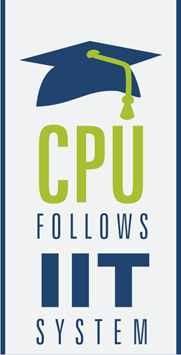 In each Course, CPU has some pre-defined credits similar to IIT system. To get a degree, students are required to complete minimum pre-defined credits and It is globally accepted. MOUs with various international academic Institutions to provide a richer educational experience to both our students and faculty. Students are given opportunity to visit various industry plants for real time exposure. Experts from industry are invited on regular basis to guide and share the industrial expectations. Industrial Training is an integral part of the curriculum for students for various essential learning to become employable. For holistic development of students, CPU offers a broad spectrum of opportunities for students to learn about themselves, other people, different cultures and the world around while making important contributions to our society i.e. learning beyond classroom.